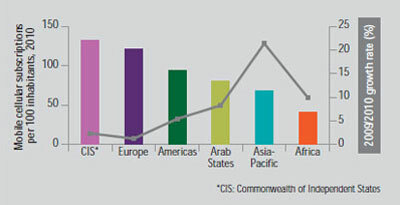 The world now boasts an estimated 5.3 billion mobile subscriptions, of which 3.8 billion are in the developing world. And Internet users have surpassed the 2-billion mark. Note — 2010 data are estimates. Note — Data refer to 2010 and are estimates. More than 90 per cent of the world’s population now has access to a mobile network, making mobile telephony truly ubiquitous. ITU data indicate that of the estimated 5.3 billion mobile subscriptions worldwide today, 940 million are subscriptions to third-generation (3G) mobile services (also known as IMT-2000). Growth is strong in developing countries, from 53 per cent of total mobile subscriptions at the end of 2005 to an estimated 73 per cent at the end of 2010 mainly driven by the Asia-Pacific region. 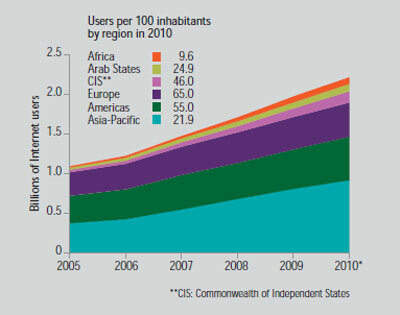 India and China alone added over 300 million mobile subscriptions in 2010. In Africa, penetration rates were forecast to reach an estimated 41 per cent at the end of 2010 (compared to an estimated 76 per cent globally), leaving a significant potential for growth. In developed countries, growth in mobile subscriptions has slowed considerably during the last five years, with a marginal year-on-year growth of 1.6 per cent from 2009 to 2010. In those countries, the mobile market is reaching saturation levels with on average 116 subscriptions per 100 people, according to ITU’s publication entitled The World in 2010: ICT facts and figures on which this article is based. The trend from voice to (mobile) data applications is reflected in the growing number of messages sent via mobile phones using the short message service (SMS). 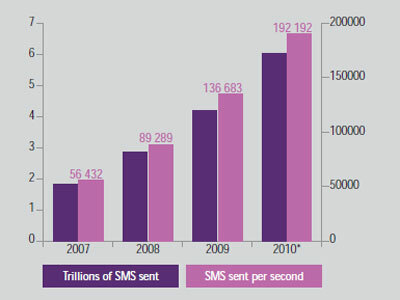 The total number of SMS sent globally tripled between 2007 and 2010, from an estimated 1.8 trillion to a staggering 6.1 trillion. In other words, close to 200 000 text messages are sent every second. The number of people online has doubled in the last five years to surpass the 2-billion mark at year-end 2010, of which 1.2 billion are in developing countries. China is the largest Internet market in the world, with more than 420 million Internet users. A number of countries, including Estonia, Finland and Spain, have declared access to the Internet as a legal right for their citizens. Of the 226 million new users that came online in 2010, an estimated 162 million are from developing countries, where growth rates have been higher. Nevertheless, connections in the developed world still outstrip those in the developing world, with an estimated 71 per cent of the population in developed countries now online, compared to just 21 per cent in developing countries. Regional differences are significant: 65 per cent of Europeans are online compared to only 9.6 per cent of Africans, far behind both the world average (30 per cent) and the developing-country average (21 per cent). 3G/IMT-2000 services are now offered commercially in 143 countries. A number of countries, including Sweden, Norway, Ukraine and the United States, have started offering commercial services at even higher broadband speeds than those for 3G/ IMT-2000, moving to next-generation wireless platforms (or 4G). The emergence of 3G networks and services will increasingly allow users to access the Internet through mobile networks. This is particularly important in developing countries, where fixed broadband infrastructure is very limited. An estimated 1.6 billion people have access to the Internet at home, up from 1.4 billion at the end of 2009.In developing countries, 22.5 per cent of households have a computer and only 15.8 per cent have Internet access (compared to 71 per cent and 65.6 per cent, respectively, in developed countries). In some countries, including the Republic of Korea, the Netherlands and Sweden, more than 80 per cent of households have Internet access, almost all of them through a broadband connection. By the end of 2010, fixed (wired) broadband subscriptions reached an estimated 555 million globally (or 8 per cent penetration), up from 471 million (or 6.9 per cent penetration) in 2009. Despite this strong growth, penetration levels in developing countries remain low at 4.4 subscriptions per 100 people, compared to 24.6 in developed countries. Africa lags behind when it comes to fixed (wired) broadband. Although subscriptions are increasing, Africa’s penetration rate of less than 1 per cent illustrates the challenges that persist in increasing access to highspeed, high-capacity Internet access in the region. Demand for higher-speed connections continues to surge with the rapidly growing high-bandwidth content and applications on the Internet. For example, at the minimum broadband speed of 256 kbit/s, downloading a high-quality movie takes almost 1½ days, compared to 5 minutes at a connection speed of 100 Mbit/s. But prices remain disproportionately high, especially in those countries with low incomes. Although fixed (wired) broadband prices dropped by 42 per cent between 2008 and 2009, there are still huge differences between countries when it comes to affordability. In 2009, an entry-level fixed (wired) broadband connection cost on average 190 PPP$ (purchasing power parity in USD) per month in developing countries, compared to only 28 PPP$ per month in developed ones. Mobile cellular services are much more affordable, with an average monthly cost of 15 PPP$ in developing countries compared to around 18 PPP$ in developed countries. Pricing of broadband will continue to have significant implications for its uptake. 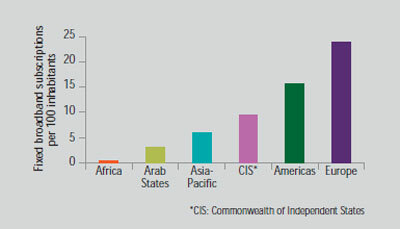 The World in 2010: ICT facts and figures was published in conjunction with World Statistics Day on 20 October 2010. The celebration of this Day acknowledges the importance of national and international statistics and aims to strengthen the awareness and trust of the public in official statistics. Within the United Nations system, ITU is the main source of internationally comparable data and statistics on ICT. The Market Information and Statistics Division of ITU’s Telecommunication Development Bureau collects, harmonizes and disseminates more than 100 telecommunication and ICT indicators from over 200 economies around the world. The Division regularly publishes analytical reports illustrating the latest trends in the sector. It monitors the development of the digital divide and has developed widely used benchmarking tools, such as the ICT Development Index (IDI). It also provides statistical training and capacity building to developing countries to improve internationally comparable data.